Writer's Digest Books, 9781599637266, 442pp. If you write or illustrate for young readers with the hope of getting published, the "2014 Children's Writer's & Illustrator's Market" is the trusted resource you need. Now in its 26th edition, "CWIM" is the definitive publishing guide for anyone who seeks to write or illustrate for kids and young adults. Inside you'll find more than 650 listings for children's book markets (publishers, agents, magazines, and more)--including a point of contact, how to properly submit your work, and what categories each market accepts. You'll also find: Interviews with some of today's hottest authors and illustrators, including author R.L. Stine (the Goosebumps series), author Marie Lu ("Legend"), author Beth Revis ("Across the Universe"), and illustrator Debbie Ridpath ("I'm Bored," written by Michael Ian Black).The ever-popular "First Books" article, where debut writers and illustrators explain what they did right and how you can follow in their footsteps to success.In-depth articles on picture books, query letters, novel voice, author platform, the status of indie-publishing, literary agents, and more. 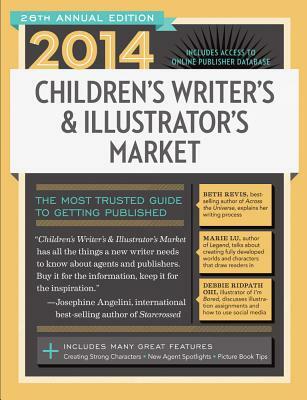 "I buy a copy of "Children's Writer's & Illustrator's Market" every single year. It's the definitive, must-have resource for children's publishing." --Jesse Klausmeier, author of the picture book "Open This Little Book"
""Children's Writer's & Illustrator's Market" is a great resource for artists and writers who are ready to share their talent with the world." --Meg Cabot, author of "The Princess Diaries.